New six-pack of 20x20x1 MERV 8 pleated air filters. Tired of spending tons of money on name-brand air filters at the big box stores? 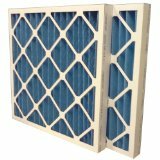 Wish you could save money and buy multiple filters that are made in the USA? U.S. Home Filter can help save you money on your replacement air filter purchase by buying direct from the manufacturer. This six-pack of 20x20x1 MERV 8 replacement pleated air filters are made in our own production facility where we oversee each stage of manufacturing from our plant in Kansas City, not in some other country. This filter comes with a MERV 8 rating, which helps reduce dust, mold spores, pollen, and other particles that make their way into your home. We also offer the 20x22x1 pleated air filter in a MERV 11 or MERV 13 ratings to further reduce particles in your home, as well as odor control variations. 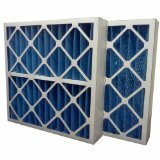 Click here to view all the 20x20x1 pleated air filter variations that U.S. Home Filter offers. Need help remembering to switch out your air filter every month? Be sure to sign up for our Filter Change Reminder service, and we’ll let you know when it’s time to replace your filter, and when it’s time to order more replacement filters. Be sure to check the “Additional Information” tab to make sure this filter is right for your system. If you have any questions about this filter, or any of our replacement air filters, one of our customer services agents would be happy to help make sure you select the right whole house air filter to fit your system. As with all of our orders, all of our filters are shipped for free as long as you live in the US. 19-1/2" x 19-1/2" x 3/4"